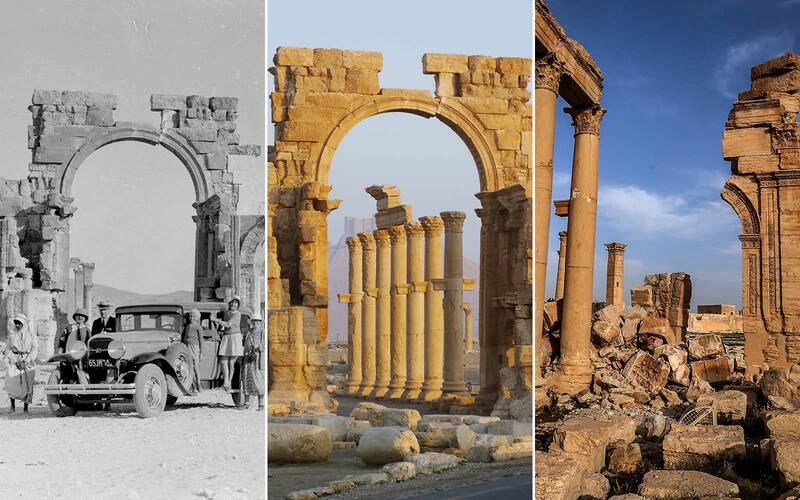 The Triumphal Arch of Palmyra in Palmyra, Syria [left to right: circa 1929, 2008, and 2016]. 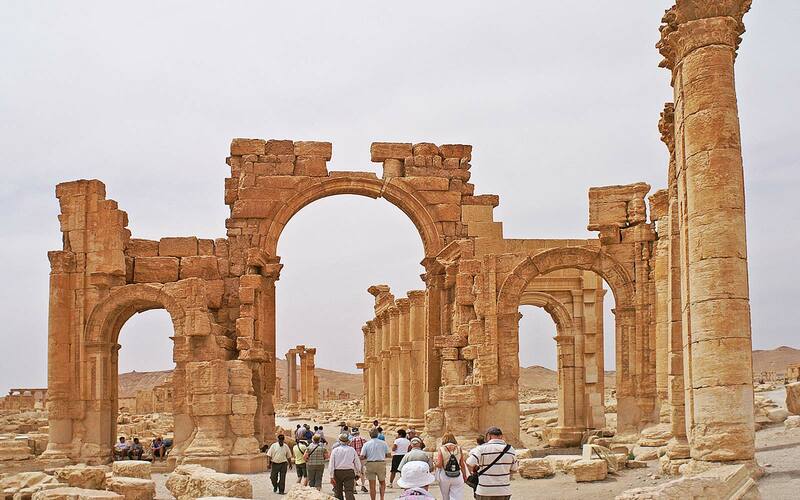 The arch, which stood for 2000 years in Palmyra, was destroyed by ISIS in 2015. Meet the historians, archeologists, and Syrian civilians risking their lives for a piece of world heritage in Palmyra. Equipped with bulletproof vest and helmet, Dr. Mechtild Rössler set off in an armored vehicle last April toward Palmyra, Syria. Bustling along the dusty road, she knew that the area had not been entirely de-mined. Russian teams had removed 3,000 land mines from the treasured archeological site, but handmade devices left by the retreating Islamic State group still remained. Access was limited, given the remote location of Palmyra as well as the remaining IEDs, and all members of her UNESCO team proceeded with lingering awareness of the surrounding danger. “It was one of the most difficult missions I did in my 25 years at the UNESCO world heritage center,” Rössler, president of the cultural heritage division of the international organization, told Travel + Leisure. Palmyra, which means “city of palm trees,” is a cultural oasis: Its towering 1st- and 2nd-century architecture looms out of an otherwise empty landscape, surrounded by steep hills. Nicknamed “the Bride of the Sands,” the ancient city carves itself into a desert valley about 150 miles outside of Damascus. Many of its structures remained relatively untouched by the intervening centuries—until 2015. When the militant organization known as the Islamic State, or ISIS, stormed the city for the first time in May 2015, they destroyed some of the most remarkable monuments, including the Temple of Baalshamin and the Temple of Bel, both nearly 2,000-year-old structures dedicated to pre-Islamic gods. By the time Rössler and her team gained access to the site one month after its liberation, their task was first to document the damage, before making any plans for its repair. Surveying the wreckage of the former temples, both of which had been reduced to rubble, Rössler looked for what could be salvaged. A bomb had torn through two stories of the neighboring antiquities museum that had contained hundreds of mosaics, funereal busts from the third century, as well as Greco-Roman jewelry and sculpture. Much of the site, she began to realize, was beyond repair. Palmyra suffered another heavy blow when ISIS retook control of the site in December, threatening further destruction. If the city is again liberated and brought back under the control of international coalitions such as UNESCO, preservationists and archeologists will again debate which structures should be rebuilt, and how best to preserve the legacy of one of the most spectacular archeological sites in the world. Previous visitors are also proving integral to the battle to preserve Palmyra. The site is being reconstructed in 3-D using old vacation snapshots, which become precious data points in an effort to recreate this world in virtual reality for those who may never experience it firsthand. Palmyra is a city primarily constructed nearly 2,000 years ago. Its lofty colonnades remind visitors of the heavy Greco-Roman influences, while its temples devoted to an amalgam of different gods speak to its spiritual metamorphosis. Unlike other archeological sites that contain only one element —a church, a marketplace—Palmyra is an entire city. With temples, an amphitheater, arch-topped streets and tombs, entering its borders is an otherworldly experience. Beyond its immediate and imposing beauty, Palmyra stands as a cherished monument to multiculturalism, a place where people from East and West met, traded, and lived together. Often called a “cradle of civilization,” the location is approximately halfway between the Mediterranean Sea and the Euphrates River, making it a natural meeting place. People lived in the area as early as the 19th century B.C., though the city’s pinnacle arguably began in the 2nd century A.D. Conquered alternatively by the Assyrians, Persians, Romans, and Greeks, the desert city adopted many of the artistic and religious practices of its various rulers, taking on a style all its own. For that reason, Palmyra represents some of the things that ISIS says it hates most, including pre-Islamic art and gods, which the group considers idolatry. Europeans, Americans, and people from across the world also revere the Syrian site, leading ISIS to claim that it attracts “infidels” who want to pollute local Islamic society. A nearby oil field contributes to the financing of the group’s campaigns across Iraq and Syria, and unexcavated objects from the city also provide a valuable source of income on the black market. 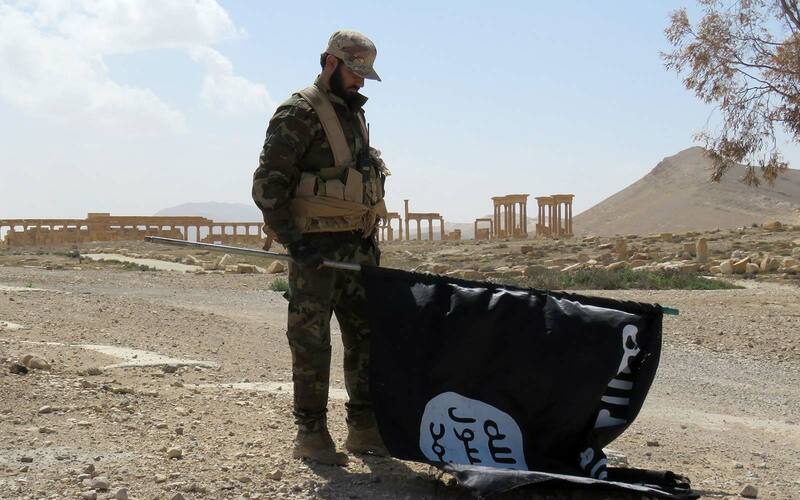 A member of the Syrian pro-government forces carries an Islamic State group flag as he stands on a street in the ancient city of Palmyra in March 2016, after troops recaptured the city from IS jihadists. By destroying or severely damaging structures such as the Temple of Bel, the Arch of Triumph, and, most recently last month, sections of the Roman amphitheater, ISIS sends a strong propaganda message, according to experts such as Michael Danti, the director of the cultural heritage initiatives program at the American Schools for Oriental Research (ASOR). These explosive videos demonstrate both for their allies and for their enemies that they are a force capable of blowing away thousands of years of work, life, art, and history in a few moments. “This is the worst cultural heritage crisis since the second World War,” Danti told T+L. The many Syrians who have risked their lives and even died to protect the future of Palmyra stand as the first defenders against this crisis of cultural heritage. As ISIS troops first approached Palmyra in 2015, archeologists and locals made a last ditch attempt to save some of the treasures of Palmyra. They rushed into the antiquities museum, wrapping small sculptures and artifacts to load onto trucks as the militants followed close behind, barricading objects that were too heavy to move. But the effort to evacuate Palmyra came mostly too late, and three museum workers were wounded by ISIS gunfire as they escaped with several truckloads of artifacts, National Geographic reported. Their colleagues deposited the wounded at a nearby hospital and continued on to Damascus with their salvaged pieces, bringing them to a safe hiding space outside the grasp of the militants. One of Palmyra’s foremost scholars and champions did not survive the siege. Referred to by colleagues as “Mr. Palmyra,” archeologist and historian Khaled al-Asaad, who had dedicated his 40-year career to the site's excavation, refused to leave the city limits as the group gained ground. Militants claimed that al-Asaad withheld information concerning the hiding places of certain buried treasures; other scholars said he simply had nothing to tell them. The 82-year-old remained silent while held a captive for at least a month. ISIS eventually beheaded the scholar and hung his decapitated body from a stoplight. Despite the efforts of these scholars and locals, authorities were not able to evacuate all of the objects, leaving the site open to looters and to the willful destruction of militants. While ISIS held control of Palmyra from May 2015 to March 2016, dozens if not hundreds of the artifacts disappeared, presumably destroyed or stolen. Those sculptures, mosaics, and other ancient relics might not be gone forever, thanks to the determination of a network of cultural heritage defenders. Amr Al-Azm, 53, served as head of science and conservation for the Syrian Antiquities Department in the years leading up to the Syrian civil conflict, while also working as a prominent archeology professor at the University of Damascus. As life became untenable under ruler Bashar Assad in the mid-2000s, Al-Azm fled to Turkey and then to the U.S., where he began to lead a group of locals, professional archeologists, and other Syrian activists in a secret underground network, sharing the details of disappearing objects of antiquity. “Any cultural heritage in an area also becomes part of the battlefield,” Al-Azm told T+L. Syria is home to six UNESCO world heritage sites, with many more archeological locations still unexcavated. Left: An archaeologist from the Archaeological Institute of Kashihara (Japan), uncovering sculptures of Tomb H, in the South-East necropolis of Palmyra in 2002. 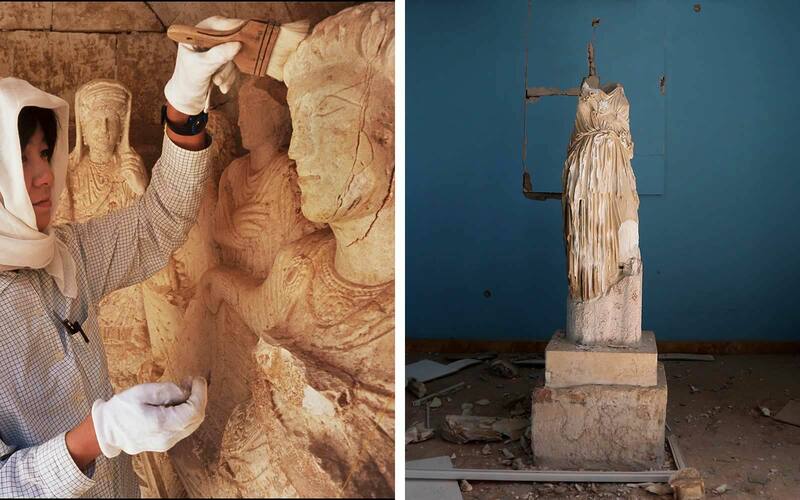 // Right: A beheaded and mutilated statue is seen in a destroyed museum in Palmyra in March, 2016. 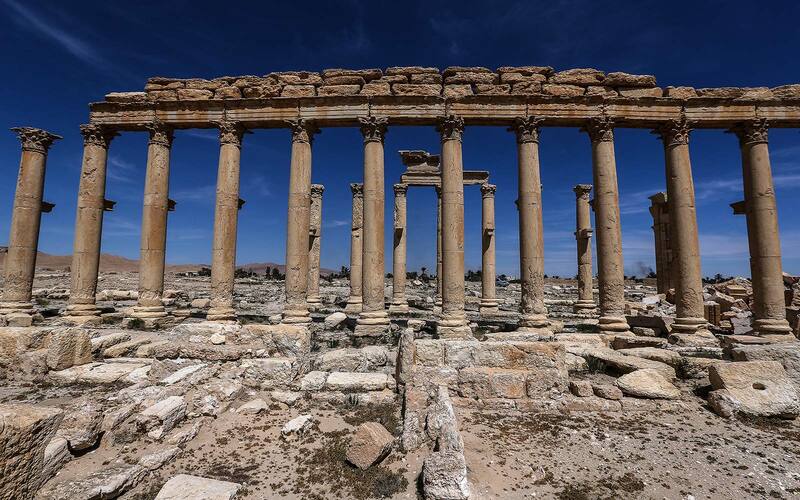 Syrian troops backed by Russian forces recaptured Palmyra on March 27, 2016, after a fierce offensive to rescue the city from jihadists who view the UNESCO-listed site's magnificent ruins as idolatrous. Nicknamed the “Monuments Men” for their similarity to soldiers and civilians during World War II who hid precious artworks from the invading Nazi forces in Europe, Al-Azm and his group, The Day After (TDA-HPI), have fortified and safeguarded much of their nation’s history from both the barrel bombs of the regime and the homemade brutality of ISIS, by evacuating and hiding it. Al-Azm’s associates also used a method called sandbagging on a number of museums to protect precious artifacts from the surrounding war. Sandbagging in this case involves barricading the perimeter of vaults, rooms, and entire museum perimeters with sandbags, allowing the sand to absorb the shock of almost any explosion except a direct blast. In the event the sandbags themselves blow up, they serve a second purpose: to cover their cargo in a thick layer of dust, shielding it from invading looters, Mother Jones reported. Palmyra is a trickier battlefield for cultural heritage protectors, however, as the invading ISIS troops took the city and then reconquered it in December 2016 in a matter of days. Sandbagging is useless once the militants have control of the site, forcing Al-Azm and his colleagues to impose a different strategy. From his office in the U.S., he meticulously tracks photos and locations of items that have gone missing. While subsistence looting became increasingly popular throughout the country as the conflict intensified in 2012, Al-Azm insists that the pillaging taking place at Palmyra is not a hand-to-mouth activity but rather an organized operation overseen by ISIS. 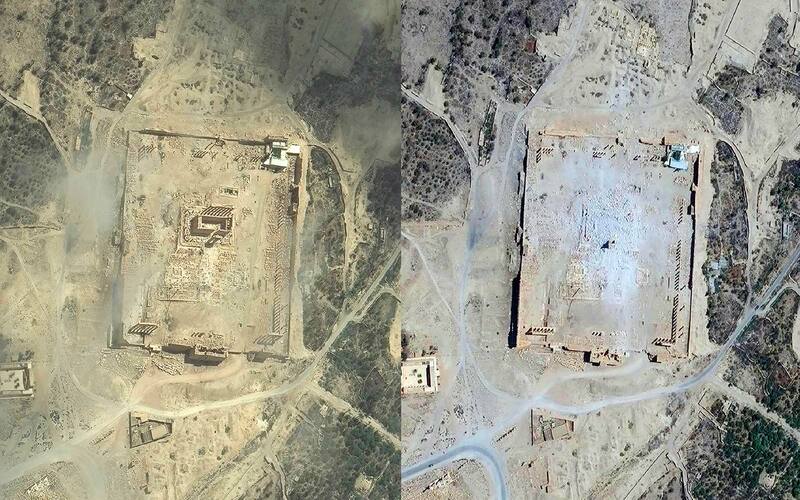 Satellite imagery of the Baalshamin temple in Palmyra, Syria collected on June 2nd, 2015 (BEFORE and then AFTER) on September 2nd, 2015 -- it was destroyed by ISIS. ISIS even rented out plots to locals so they could search for buried artifacts, according to rumors among archeologists. Al-Azm hopes that if these ancient pieces of art and history reappear on the black market or even in a respected auction house, he and others like him will be able to quickly identify them and return them to their original homes. Mentioning his two daughters who have never been able to see the site for themselves, Al-Azm spoke wistfully of a time when tourists will eventually be able to return to Palmyra, even if that day isn’t for several decades. “This conflict will end one day,” he said. If Syrian forces retake the archeological ruins, the dangers of rebuilding improperly carry a high risk to the integrity of the site. With most of the main structures in Palmyra having been completed before the end of the third century A.D., restorers are faced with the problem of rebuilding a structure they might have never seen, built with materials that no longer exist. Frahm is no stranger to the integrity of ancient sites. As an Assyriologist who specializes in early Babylonian and Mesopotamian history, safeguarding the authenticity of some of the most extraordinary ancient sites in the world is a fundamental part of his life’s work. ISIS used multiple explosives, as well as bulldozers, to topple the Temple of Bel and the Temple of Baalshamin, ensuring that the remnants would be damaged beyond reparation. Hope remains for the Arch of Triumph, which fell in large enough chunks to perhaps be put back together, Rössler of UNESCO noted. With many other sculptures, structures, and artifacts in hundreds of pieces, a good deal of treasures of the neighboring museum are lost. Botched restoration efforts have served as a cause of embarrassment in preservation communities for decades. Moreover, these mishaps can make it impossible for future generations to see anything resembling the original object. From the use of epoxy glue to reattach Tutankhamen's beard in 2015, to the amateurish quick-fix of a 19th century Spanish fresco in 2012, sloppy or inaccurate restorations brought derision from art professionals and museum-goers alike. Recent efforts from an Italian team can provide some reason to celebrate. With the help of laser scans and 3-D printing, a team of experts built prosthetics for funerary busts that militants had smashed with hammers. Even 20 years ago, the idea of restoring a shattered 2,000-year-old piece of sculpture would have been a gargantuan, if not impossible, task. For the sites that cannot—or according to some, should not—be rebuilt, other options to preserve their memory are available, thanks in great part to the development of new technologies. One of the leaders at the forefront of new methods of cultural preservation is Brian Pope, founder of Arc/k, an organization devoted to reconstructing historical sites through virtual reality. Pope, 51, who is Apache-Cherokee, explained how his Native American roots gave him an early appreciation both for the loss of cultural memory and the importance of fighting to preserve it. With a background in technology and visual effects, Pope started the Perpetuity Palmyra project in this same spirit of bringing history to life. He also plans to share his 3-D archive with scholars so that they can use his virtual reconstruction for future research. 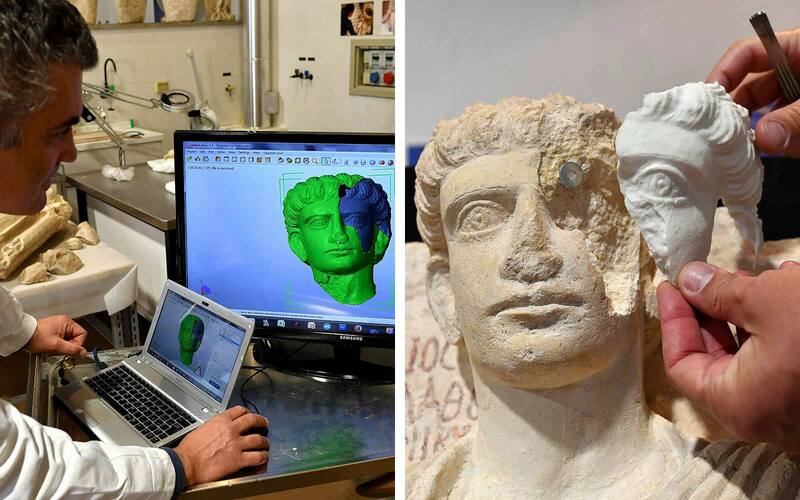 By using a process called photogrammetry, Pope’s team has used thousands of photos, many taken by amateur photographers and tourists, to recreate Palmyra in virtual reality. The digital archives and videos of this project are available through the organization’s site, and they regularly conduct demonstrations so that more people can be exposed to the beauty of this location. Putting on the VR headset has the power to transport. 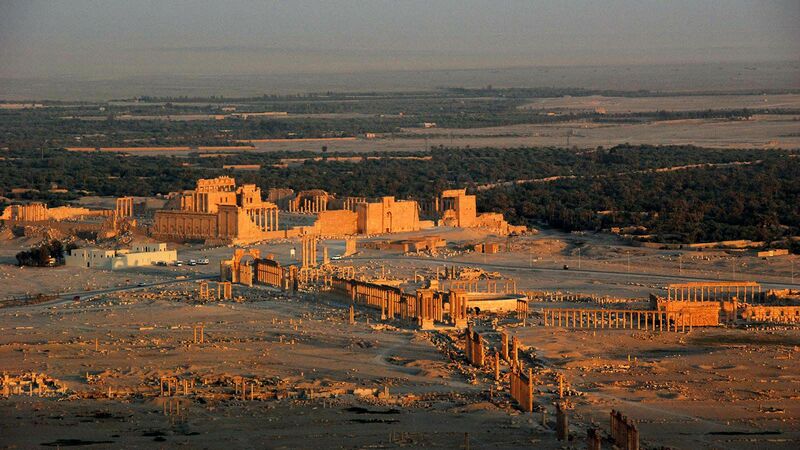 The site is reconstructed to scale, and anyone wearing the headset can sense Palmyra’s grandeur and the reverence that its imposing buildings once evoked. Arc/k has spared no detail, stitching together at least 90 photos for each small section of a building. The team checked the location and veracity of these images via their meta-data. “One of the things that all restorers are concerned with is: What is the legitimate version of an object?” Pope said. Even before ISIS arrived in Palmyra, reconstructions took place several times in the middle of the 20th century, altering the appearance of the site. “There is no single version of these things that is the correct version, so what digital technology is allowing [us] to do is to sidestep that question completely. It makes it pointless and moot,” he said. Travelers have been indispensable to Pope’s VR efforts in Palmyra. Little could they have known that the vacation snapshot they took of their visit to the site 10 years ago could now be used to preserve extinct temples. The data of tourists’ digital photographs allowed for a collage of the imagery, creating a more complete picture of each structure. “It’s the tourists that are becoming basically collectors of scientific information—crowd-sourced science,” he said. 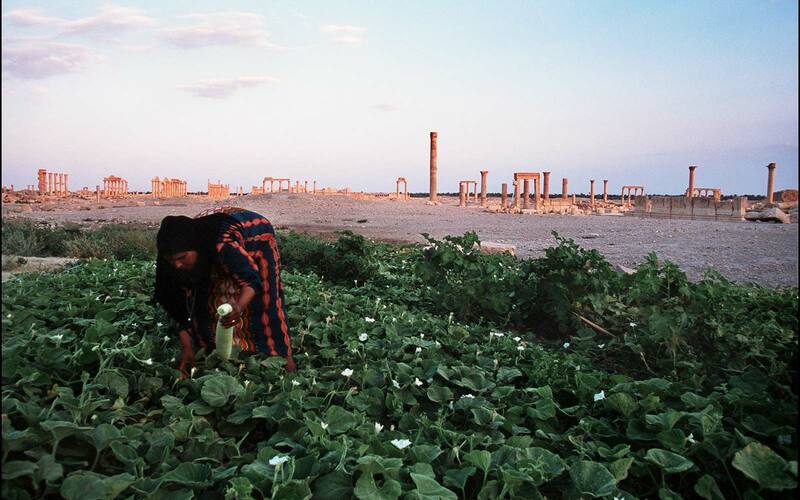 May 2010: Tourists visit the ruins of old temple complex of Palmyra in Syria. While many people in 2017 might not view Syria, and Palmyra in particular, as a tourist destination, it drew visitors from all over the world for hundreds of years. Records of explorers traveling thousands of miles to stand in front of its temples, tombs, and colonnades date as far back as the 1600s. One Englishwoman in the early 19th century spent a fortune to travel with a caravan to Palmyra, just to glimpse the sight that she had read so much about. Lady Hester Stanhope, an infamous widow and adventurer, made the journey in 1813 after becoming obsessed with the history of the similarly headstrong Queen Zenobia, who once reigned over Palmyra. Despite warnings and diplomatic obstacles, Stanhope spent 150 pounds sterling—the equivalent of $12,000—to make the trek across the desert on horseback, according to historian Browning. 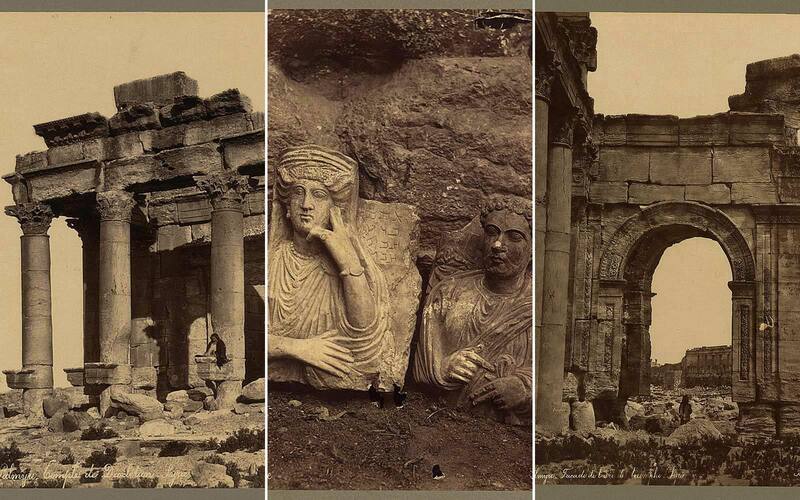 Archival images [photographed between 1867 and 1899] of remains of the Temple of Diocletian, statues, and L'Arc de Triomphe found in Palmyra, Syria. British explorers who traveled to Palmyra to make sketches of it inadvertently triggered a boom in Oriental decorating, according to Browning in his book, “Palmyra.” The influence that the Greco-Roman style of Palmyrene architecture exerted over the neoclassical revival in the 17th and 18th centuries is one of the reasons cited by UNESCO for naming Palmyra a “world heritage site” in the first place. Throughout the 20th and into the 21st century, Palmyra remained a hub for tourists from across the globe, and Europe in particular. For Pope and other Palmyra enthusiasts, the idea that tourists could one day return to the city is not an impossible dream, with VR only emboldening people to explore. 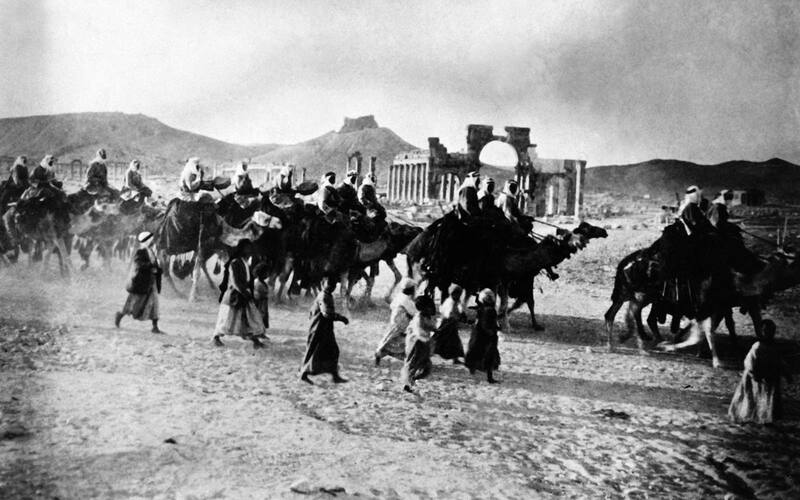 Picture released in the 1930s of a desert caravan in Palmyra, ancient city in central Syria, located in an oasis northeast of Damascus. What still remains for visitors to see when civilians finally return to Palmyra will depend largely on the outcome of the next several years. As ISIS remains in control of Palmyra, the site risks further destruction at the hands of its captors. Part of what always made Palmyra remarkable was the size of the historical site—an entire city preserved inside an expansive desert oasis. And its size may be one of its saving attributes, according to Syrian antiquities expert Al-Azm.